Greta Van Fleet have been forced to cancel the remainder of their Australian tour due to illness. 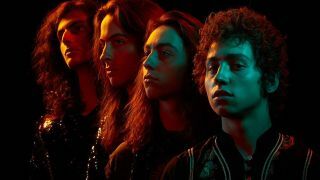 The band’s frontman Josh Kiszka has been struck with laryngitis, and, on doctor’s orders, has been told to rest his voice or face damaging his vocal cords. As a result, Greta Van Fleet’s shows in Melbourne and Brisbane were called off, with their planned show in Auckland, New Zealand, on February 8 also recently scrapped due to the band's Grammy commitments. A statement from Kiszka reads: “Dearest Melbourne fans, I have some heartbreaking news. Unfortunately, somewhere between travel from the US to Japan and Australia, I developed an upper respiratory infection that has gradually evolved into laryngitis. “I’ve been trying to recover but cannot seem to get rid of it. Doctors have informed me that performing in this condition could cause damage to my vocal cords, which is something that I cannot risk, and therefore we must reschedule our shows tonight and tomorrow. “It means the world to me to be able to perform for you, and it breaks my heart to have to do this, but I must take my health very seriously, so as to not run the risk of causing more serious harm. The band are due to play further shows across Europe later this month in support of their debut album Anthem Of The Peaceful Army. At the time of writing, those concerts are still scheduled to take place.